Discover some of the most memorable photo ops in Las Vegas. Experience the lavish and whimsical art and decor of The Cosmopolitan Resort and Planet Hollywood in a two-hour walking tour. See world renown digital art, murals, heroic sculptures, a chandelier glittering with over two million octagonal crystals, photographic art from modern to nostalgic and more. From "social dogs" to "Crazy Girls," this is an adventure that you will never forget. Discover why The Cosmopolitan Resort has been consistently ranked as one of the ten best hotels in the world. View millions of dollars of art as you stroll along elegant restaurants, shops and exhibits that you can only see in The Cosmopolitan. Meet your guide at the entrance of The Chandelier Bar, an attraction worth a visit in itself. In about two hours, your guide will lead you to some attractions that may amaze you. 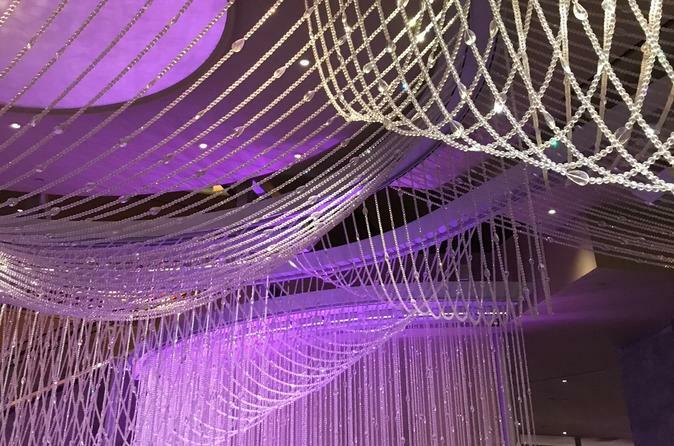 Observe from three viewing levels over two million octagonal crystals in The Crystal Chandelier. Step into Roark Gourley's 6 ft high-heel slipper for a most sought after photo op on the Strip. Discover Iain Crawford's high speed photography of fashion models. Mingle among the larger-than-life dog statues created by Mark Chatterley. View hard to find classic Las Vegas photographs. Be entertained as eight 15 feet digital columns present world renown kinetic digital art. photo op with "Crazy Girls" statue. See over 200 objects of decorative and modern art.